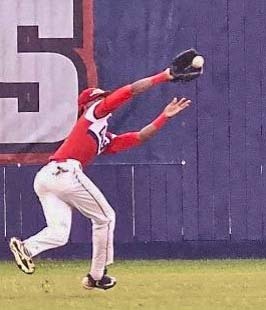 GREAT CATCH - Dawson centerfielder Jalen Freeman makes a great running catch on a fly ball against Dickinson. Despite the strong defensive play, the Eagles still fell to the Gators in a best-of-three series. PEARLAND — The Dawson Eagles entered the Class 6A Region III baseball playoffs as the No. 1 seed while facing the No. 4 seed Dickinson Gators from District 24-6A in the bi-district round best-of-three series. Dickinson came into the series as the underdogs, but were peaking at the right time as they totally dominated the Eagles in a two-game sweep. In the first game, Dickinson held the Eagles offense to only three hits while they pounded out nine hits for a 5-0 shut out to take a one game lead in the series. The Gators scored a run in the bottom of the second for a 1-0 lead and then added a run in the fourth, two runs in the fifth, and an insurance run in the sixth while keeping Dawson off the scoreboard. In the second game, Dawson hosted the Gators at home in a must-win situation. Once again, Dickinson dominated in the opening frame with three runs and increased the lead with two more runs in the third for an early 5-0 advantage. Dickinson's offense continued the onslaught with three more runs in the fifth for an 8-0 lead and added one more in the seventh making the score 9-0 before Dawson scored two runs in their final at bats making the final 9-2 to end the season for the Eagles. The Gators pounded out 15 hits while holding the Eagles once again to only three hits. Despite the poor showing in the playoffs, the Eagles still should be proud of their season after going 12-0 in league play to capture the District 23-6A crown.